On April 14, the Atlanta Braves will begin a new era at SunTrust Park, the all-new 41,000 seat ballpark just 10 miles north of Downtown. The park is surrounded by The Battery Atlanta, a 1.5 million square foot mixed-use development, featuring chef-driven restaurants, boutique shopping, an Omni Hotel, The Coca-Cola Roxy Theatre, 550 residences and One Ballpark Center, Comcast’s regional office headquarters. Braves fans can expect many new game day experiences on their first visit to SunTrust Park. 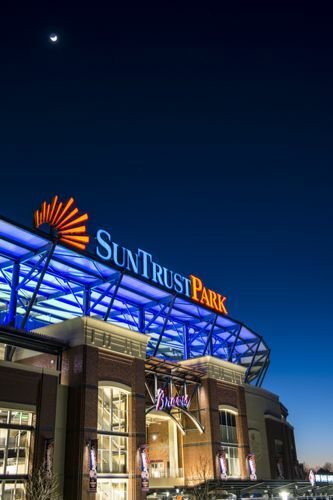 SunTrust Park: Designed with the baseball fan in mind, SunTrust Park is 20 percent smaller than Turner Field, creating an intimate seating configuration placing fans closer to the field than any other MLB stadium. For fans looking for an upgraded experience during the games, they won’t need to look any further than the stadium’s 4,000 premium seats offered in three areas – SunTrust Club, Delta SKY360 Club and Terrace Club. Making the transit from Turner Field, the Chop House has been reimagined as a three-level entertainment space with two party decks, field level seating and full menu and bar. The Battery Atlanta: Flowing directly into the stadium, The Battery will serve as a year-round live/work/play destination and the starting point for game days. The Battery will offer more than the standard ballpark fare, featuring several concepts by a few of Atlanta’s award-winning restaurateurs – Ford Fry and Linton Hopkins. Fry will bring the second location of his “Mex-Tex” restaurant El Felix as Hopkins plans to open a steak house concept. The Battery also features more than 4,000 square feet of retail space, including Mizuno Experience Center and Harley-Davidson retail store. For entertainment beyond the ballpark, the iconic Coca-Cola Roxy theatre makes a comeback at The Battery, welcoming headlining artists throughout the year. The family-friendly entertainment concept Punch Bowl Social will feature eight bowling lanes, one bocce court, three private karaoke rooms paired with a Southern-inspired scratch-made menu and craft beverage program with “old-school” social activities and vintage video games.